SQL Server Express is a free edition of Microsoft SQL Server family that although fully functional, it has some technical limitations like maximum database size per database. It also has some features missing from paid editions. One of those features not available with Express edition is SQL Profiler. In this post I will list the alternative tools for SQL Profiling that can be used with either SQL Server Express or can be used as the SQL Express replacement. For me the need for SQL Profiler became apparent when I was playing with Entity Framework and started to use LINQ To Entity Queries. I started to wonder what kind of SQL statements my LINQ syntax generates and this is where SQL Profiler comes into play as it provides the ability to inspect SQL statements that are sent to the database. Since paid editions of Visual Studio cost so much, I looked on the web if there are some cheaper or even free alternatives to SQL Profiling. One alternative is to replace SQL Server Free Edition with SQL Server Developer Edition 2014 (Available at Amazon ). It is basically a fully working SQL Server Enterprise Version with all the features included like SQL Agent and SQL Profiler, but you are limited to use it only for development and testing. So what you get with SQL Developer Edition is an Enterprise Version with only a fraction of the cost. If you are only looking for SQL Profiler without spending any money, then this might be the tool for you.xSQL Profiler is free for one SQL Server instance and also works with SQL Express. You need to provide your name and email before you can download this tool. ExpressProfiler (aka SqlExpress Profiler) is a simple open source replacement for SQL Server Profiler with basic GUI. It supports both SQL Express and non-Express Editions. This is a desktop application on CodeProject written in C# and .NET 4 in 2014. 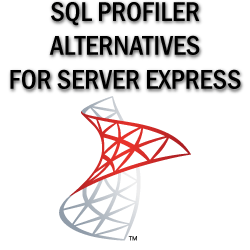 It supports tracing with SQL Server Express in real-time much like SQL Server Profiler. The application was tested with SQL Server 2008 R2 Express and SQL Server 2012 Express. I would thank the commentators below guest and mDude for suggesting some of the alternatives mentioned here. If you know of any other alternatives for SQL Profiling, let me know and I will add them to the list. This article was first published in September 2012 and has been updated and republished. Thanks for the brief review, xSQLProfiler really helps with EntityFramework.